Bring a traitor to justice. 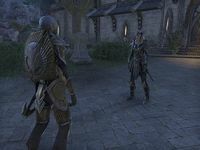 At the request of the captain of the Vulkhel Watch, I've been running errands all over Auridon's port city. I even helped a watchman deal with a cornered man, who claimed that the Captain has been co-opted by a group called the Veiled Heritance. Speak with Watch Captain Astanya. Meet with Razum-dar and follow his instructions. Find Watch Captain Astanya to ask her a question. She interrupts you, placing you under arrest for plotting to kill the queen—and you've got poisoned meat and secret documents on you, enough evidence to prove to others that you're up to no good! She knocks you out, taking you to the prison. Once you wake up, you'll notice Fasion lying near you, dead, in the cell. Razum-dar calls out to you, revealing himself to be an agent of Queen Ayrenn. He says he was good friends with both Astanya and Fasion, but never expected Astanya would do this. He lets you out of the cell, directing you to warn the queen and her Battlereeve about the assassination plot. Find your way out of the prison and go to the market to find Eshaba, another agent working as a merchant. Request a souvenir of the First Marines. She'll tell you to check the chest behind her, which contains a Vulkhel Guard Marine Disguise to help you enter the temple area without incident. Don the outfit, get past the guards, and speak with Battlereeve Urcelmo about the danger. He informs you that everything is under control, thanks to Captain Astanya, and he doubts your claims. The queen herself, having overheard the conversation, wanders over and requests that you follow through with your investigation on Astanya and check out the temple. When you enter the temple with Urcelmo, Astanya appears on the second level, sending assassins against you. After all six are defeated (attacking two at a time), she will come down to fight you herself. Once she's dead, return to the queen, who is disappointed that Astanya really was behind the plot. She asks if you would like to become an elite agent, and requests that you meet her at Tanzelwil, a ruin to the north. It's possible to skip the disguise section by entering the temple area through the Vulkhel Guard Outlaws Refuge. Sometimes when the assassins jump down from the balcony, they will run through the wall and disappear. Exiting and then re-entering the Temple of Auri-El will reset at least one of the assassin's positions, allowing you to continue the quest. I need to discover if Fasion's claims are true. I should confront the captain near the manor house. I found Watch Captain Astanya. Time to get to the bottom of this. Well, that didn't go well. I woke up in a jail cell and Razum-dar is standing outside my cell. I should speak with him. 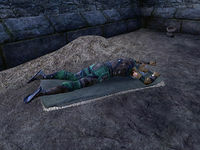 Razum-dar indicated that I need to slip past the manor guards in order to get close to the Queen. He suggested I speak to one of his connections, Eshaba, in the market. I need to ask her about a souvenir of the First Auridon Marines. Optional: Raz may have more information on the situation at hand. I made it into the temple district. Now I need to seek out Battlereeve Urcelmo and the Queen and report what I've learned. I should allow Battlereeve Urcelmo and Queen Ayrenn to consult. I should follow Battlereeve Urcelmo into the temple. We made it into the temple. Now to look around and see what's happening in here. This is it! If I can foil Captain Astanya's plan, that should keep the Queen safe for another day. Time to report back to Queen Ayrenn. Finishes quest I need to give my answer to the Queen about her generous offer.